Colonial Part Quito, three blocks away from independence square. 30 – 60 minutes to airport depending on traffic hour. Geranios 1: Suite with twin beds, private bathroom and sofa bed. Geranios 2: Double bed, balcony and private bathroom including tub and shower, bathroom is located 3 steps outside the room. Geranios Deluxe: Double bed and bathroom inside room. Panecillo: Suite with double bed, private bathroom, small bar, view of El Panecillo. Panecillo deluxe: Double bed, private bathroom inside room and a sofa. 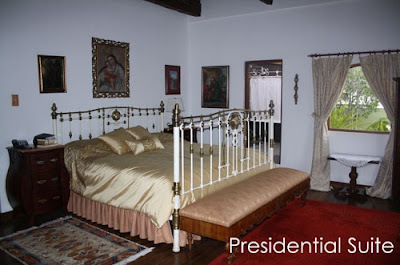 Presidential suite: Double bed, large kitchen, living room, 2 balconies, 1 chimney and large bathroom with bath tub.